Our recommended Urban Exploring Gear | What is in our Urbex Bag? You are not going anywhere if you cannot see. Bring the right light is key. 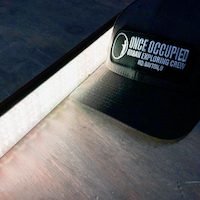 Light an entire room or hallway like no led flashlight ever could. You can also easily adjust the intensity and tone of the light. Go more than 1.5 hours on a single change. This is our must have. The Godox is the better option if you want some to mount on a camera. The Yongnou is just as bright but also can do RGB Colors. TIP: Don’t leave the battery in the light when in your bag. It can turn on and will get crazy hot and could catch your bag on fire. Wear throughout your explore or just when your crawling or climbing. Never forget your backup flashlight. A good small LED flashlight is perfect for if it is raining and you want to keep your primary light dry. About every 10 explores or so this gem ends up being my primary because I forget the batteries for my big light. Getting great photos and video is a great way to share and remember your adventures. A GoPro Hero is a great way to capture high-quality video at a wide angle. Using a smartphone for video provides a too narrow field of view. Use it as your primary exploring camera or as a second camera to record the entire explore just in case something wild happens or if you need to prove you did not take or damage anything. We have several of these tripod phone mounts and they work great and will even hold a plus-sized phone with a medium thickness case with no issues. The most recent upgrade to our exploration gear. Perfect for capturing aerial footage as well as scouting out a location. This drone is well built and folds up so it can easily be transported in your carry on when traveling. When carrying a full-sized tripod is a huge pain we just grab our mini tripod. Great for not only selfies but more often than not great for looking over walls or in high windows. Great tripod at a reasonable cost that has held up well for several years. In this video, I show you how to make a GoPro bump cap hat that not only protects your head but also allows you to film your urban explorations with a head-mounted GoPro. We use this method to document 100% if our urbex adventures. Using an open frame housing on the GoPro also allows for decent audio recording. This setup would also be great for various other outdoor sports like fishing, hiking, or rock climbing. Check out our link below to everything you will need to make your own bump cap GoPro mount. 1/4-20 x 3/8″ long button head machine screw and rubber washer from a local hardware store. No picture is worth risking your one life when it is so easy to wear the proper Personal Protective Equipment. Protect your lungs by picking up a 3M respirator mask with P100 filters. Suitable for most explorations and very inexpensive. Will protect against particles such as mold and asbestos. Will not protect against gases so it may be a good idea to grab a set of carbon filters also. Shoots like 30 feet. Great way to protect yourself from wild animals or wild people that may be living in an abandoned place. We always recommend running away or making friends but you never know when you will need some protection. Great backup to your bear mace that is perfect for the explores where you want to carry the least amount of gear. We carry survival whistles just in case we would get separated and get hurt. A great hiking knife that fits tightly in the holster. High-quality build and slim. Never run out of power when you need it the most with an Anker Power Pack. TIP: Use a short charge cable and your phone and the power pack will fit in your pocket. The best travel accessory is simply a purple Crown Royal bag. Perfect for carrying those extra batteries. A high-quality backpack or fanny pack is critical to carrying all the gear. Hiking backpacks are supported by a hard frame that keeps the bad from resting directly on your back allowing airflow to keep you cool. They also have lots of tieoffs for gear.